Better! Butter! 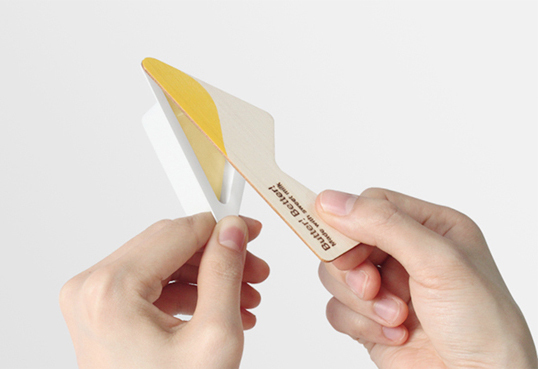 is a design concept by YeonKeun Jeong. The package is designed to offer convenience to those on the go. 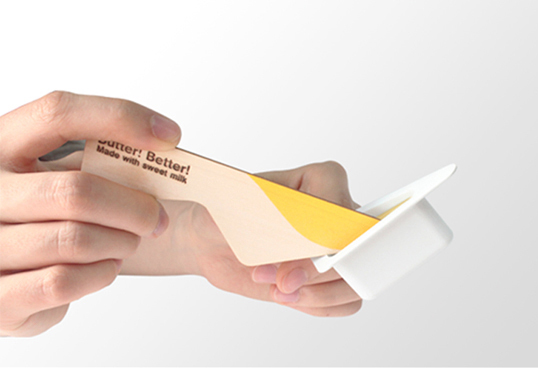 The top is not only is apart of the packaging but also but also doubles as a wooden utensil to spread your butter. 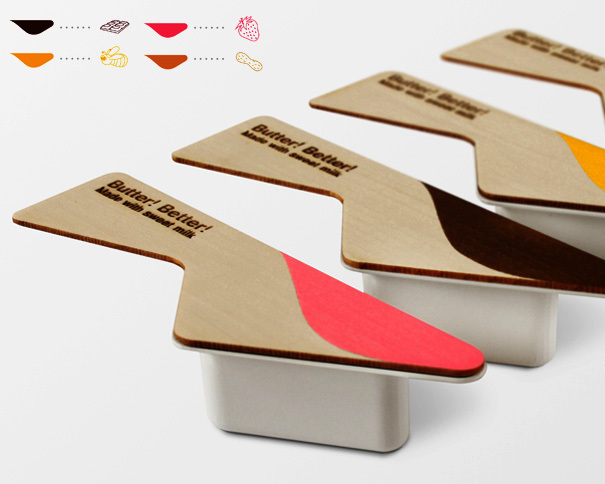 Functionally meets deliciousness meets beautiful modern design. Made from sweet milk it comes in 4 yummy flavors too: honey, chocolate, peanut butter and strawberry. I am hoping someday these will be available for purchase and maybe for ice cream too. I can definitely see packing these in lunches, road trips and picnic baskets. 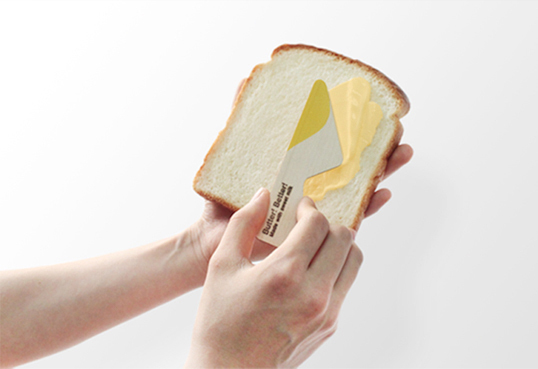 Awesome design now we can eat tasty bread for breakfast without spoon. 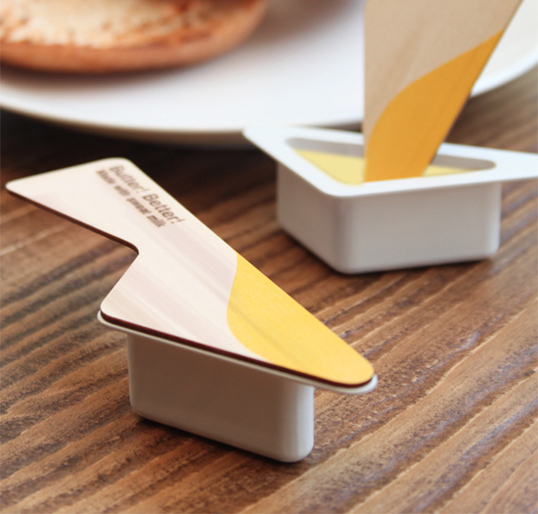 Because of this design it has already a plastic cup with a plastic thing like spoon. 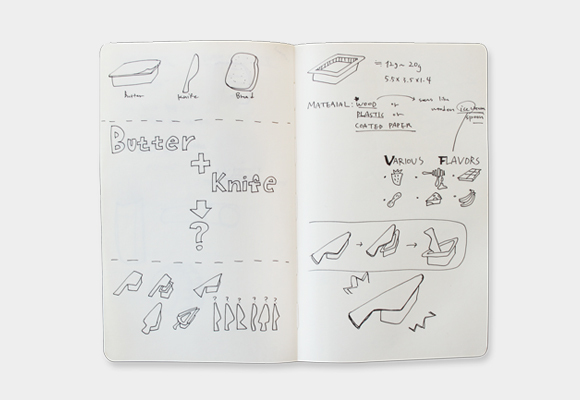 We can also make a thing like that all you need to do is you know how to pack a things for your family. I really loved your great packaging design blog, but it appears that you have put a lot more work into it. I will keep your blog in my twitter so I can come back and see it again when it has some new information. Good subject! Wow! 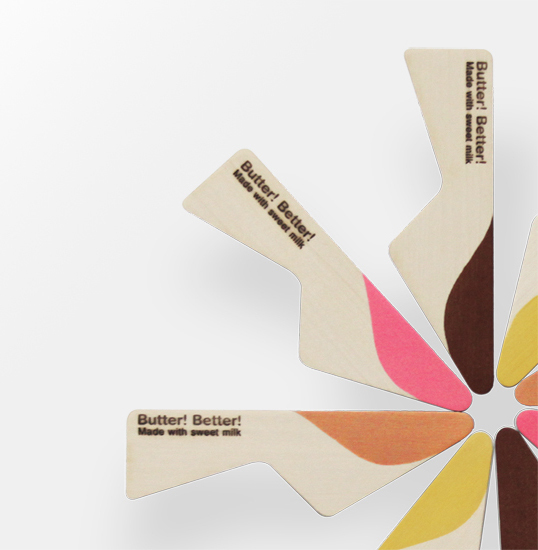 This packaging for butter is really very creative. I am always thinking of such packaging designs which are creative, cheap and easy to implement.Packaging along with labels have a huge impact on customers decision making. A creative packaging always fascinates people. Great diary web site.. i'll be genuinely stunned so you accomplish an excellent appreciative work.. thanks for expressing... i prefer to look at that subject. please point out some factor further... Appreciate it. I like this website shown in addition to it has given me several sort of inspiration to have success for certain reason, so thanks. Thanks for sharing your sites i am glad to see your site. this is very nice. Share or Offer your information, designs, recognizable, 3d designs, works of art, images, etc., earn money, and get used worldwide. Sign-up via e-mail or your group media problem here: http://www.ehuub.com/login/ by choosing category "GRAPHICS, DESIGN, AND MULTIMEDIA", thank you! here is the best place for brave frontier game hack and cheat.this is the link to the homepage for free gems and coins.